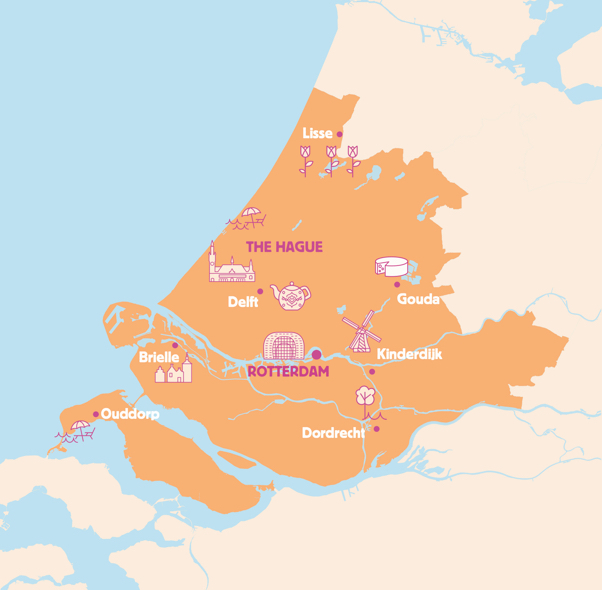 With a Tourist Day Ticket you enjoy unlimited travel by bus, tram, metro and waterbus throughout the South Holland Rotterdam & The Hague region for a fixed price for a whole day. Where do you want to go? Various OV – day tickets are available, each for a different region and/or transport operator in South Holland. At the bottom of this page you will find further information about the different regions and the related OV - tickets. The tickets are valid for all types of transport stated in the region of your choice. Easy going and all-in-one: you no longer have to worry about transport to and across the Rotterdam and The Hague area. Your ticket delivered at home or at your hotel, so you can use it directly at arrival. And available at the vending machines at all subway stations. Unlimited travel in all buses, trams, metros and ferries operated by the following public transporters: Arriva, Connexxion, HTM, HTMbuzz, RET, QBuzz, EBS and Waterbus. With a Tourist Day Ticket you enjoy unlimited travel by bus, tram, metro and waterbus throughout the South Holland Rotterdam & The Hague region for a fixed price for a whole day. The ticket is valid all day from the time you first check in until services stop running. Always check in when boarding and check out when exiting the bus, tram, metro or waterbus. To check in at the start of your journey, hold your Tourist Day Ticket against the card reader at the gate or in a vehicle. At the end of your journey, hold your Tourist Day Ticket against the card reader again to check out. Repeat this action if you switch to another form of transport or another public transport company. Dear visitor, we would like to hear your opinion about this website ! Would you please answer a few questions when you're almost finished with your visit? on this web page , you have direct access to the questionnaire. Thank you very much for your time!